Macaroni. Cheese. Lunchmeat. It doesn’t get much better than this. I’ve been all week trying to figure out how to spring this little bit of Koegel’s weirdness on the folks of SE Michigan/NW Ohio. Thanks K.C. for giving me an opening! Briahna says that little thing near the middle looks like a lizard. So here it is; Koegel’s Macaroni & Cheese Loaf. 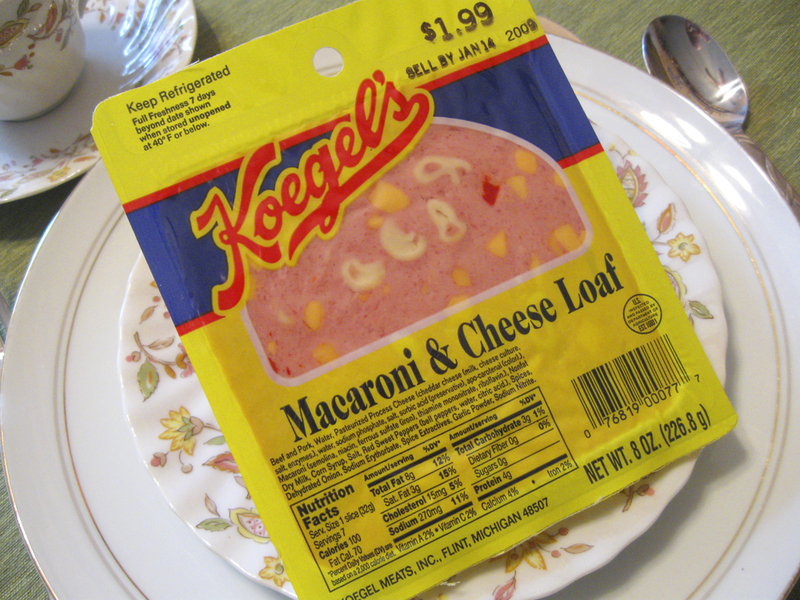 Like every other Koegel product I grew up on this stuff. Like just about every other pic of food on Luna Pier Cook in the past week this also came from Nehring’s Market in Burton, Michigan. And like any other Koegel product I can eat this by the pound. I never had it (or even heard of it) to be fair, but I think I would pass, should it ever come my way. I showed the photo to my husband, and he said he would eat it. No way. Probably because I just don’t like lunch meat, period. Hope you plan to submit your Mom’s Mac & Cheese to the Feb. Grit debate! It looks a bit microbial, doesn’t it, like very large paramecia encased in something I simply cannot describe. I admit though, we used to eat stuff just like this when I was a kid (although a different company). I liked the “olive loaf,” which was just like this except for the sliced green olives instead of mac bits. 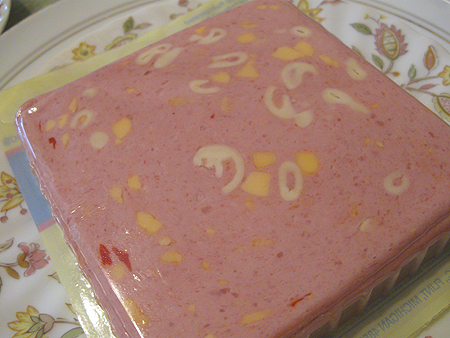 My favorite luncheon meat — that staple of my Oklahoma childhood — was “chopped ham,” which I’m now convinced was chopped ham snouts. But, hey, with a little Wonder Bread and Miracle Whip, you got yerself some lunch right there. The best sandwiches, however, were mustard and mayonnaise (which was actually Miracle Whip, which we grew up thinking actually was mayonnaise). Always on Wonder Bread, of course, and you couldn’t mix the mustard and mayo — it had to be mustard on one side and Miracle Whip on the other. Though I’ve never had it, I would guess that I would not like it. But that’s because I don’t really like lunch meat, and I am a macaroni and cheese purist. @Paula, but what about you? Are you implying you wouldn’t? @JEP at least it’s all beef. @Emily have you tried the mac-n-cheese at J. Alexander’s? It’s so good, you’d probably make that long walk from your house to the restaurant to get some! Oooo I will have to try that (@ dave, not the macaroni and ketchup sandwich). I might have to walk there and back a few times to work it off, but good macaroni and cheese is always more than worth it. Last summer Kelly (from al PA) spoke about this product or a similar one and in her blog Novelle360, http://novelle360.com/ and yesterday 1/17/09, she finally tried it and showed it to us, to almost universal rejection. I liked the olive loaf as a kid, but this does not look nearly as appetizing. Anyway, check out her blog, even though you might not agreewith the conclusions – maybe it’s a different brand! OK, Dave, its a deal, based on your endorsement, I will give your favorite Koegels brand a try, when I can find it. Didn’t realize you had comment moderation, so I left mine on your latest post thinking that you might not see it otherwise. Sorry about that. And, hey, I figure I tried one brand, so I’d be open to sampling another. Although, I must admit, I’m skeptical it could be improved upon. I do, however, agree with the plainsman. Although never trying olive loaf myself, at least the contents of that are intended to add flavor. Noodles don’t add much but substance. I’ll have to try the olive loaf one of these days just for comparison’s sake. Thanks for providing another perspective on what I’ve dubbed The Loaf! Absolutely! This lunch meat brings back great childhood memories of 30 years ago. My sandwich was extra special when Mom fixed this kind. In fact, I will grab this mac and cheese loaf for my next homemade sandwich! I love this stuff, I remember it in an orange package. WISH I COULD STILL GET IT. Wow, I’ve never seen anything like this… and it looks (oddly enough) tasty looking! I remember my Grandma making simple sandwiches on squishy white bread, a slice of American cheese (she always had the giant loaf that she would slice herself rather than the individually wrapped cheese slices) and just a tiny bit of mayonnaise. Hells ya my brother and I used to eat this crap all the time when we were kids! My mom would ask us what we wanted for lunch and it was always “macaroni bologna” with mayo and a glass of apple juice! Not sure if I could eat it now, it looks pretty gross, but I still don’t mind regular bologna sandwiches once in a while, so macaroni bologna might still be good! Im sure the fiance would dig it tho, he’ll eat anything. To Die For! And to those who won’t eat it, or even try it, GOOD! Leaves more for ME!!!!!!!!!!!! Ughh.. We were brought up on this stuff, I would not eat it now. I didn’t like it then or now.. and I like everything else that I ate as a child I think. Macaroni and cheese loaf is one of the finer things in life. Would almost pass up a steak for it. Grew up eating it in Northern New York, and when I go to visit this is one of the three things I get to eat. Macaroni and cheese loaf, Glazier hot dogs, and Koffee Kup donuts ( made in Burlington, Vt. Ate this all the time when I was growing up, it’s soooo good! Can’t find it now in the packages but one store still has it in the deli, actually just bought some yesterday. Try it? Lmao I am in my 40s and still enjoy a good mac n cheese sandwich. One of my fave lunch meats! Hi Philip … Koegel’s On The Road delivers to Florida on occasion, and takes orders ahead of their visits. Keep an eye on http://www.koegelsontheroad.com for future Florida trips. I grew up eating macaroni and cheese loaf as well, although I grew up in Northeastern Pennsylvania. Our brand was Kunzler. Ours also has pimentos in it. It’s actually very good. I live in Ohio now, and people have never heard of it. I’ve lived in WV too, and they haven’t heard of it. I was starting to think it was only a Pennsylvania thing. People don’t knock this until you try it. I love this. Always have. I remember as a child mom getting this from the deli and the workers giving me a rolled peice. Now that I’m 32, I can 100% honestly say my hubby and I buy a lb every time were at the deli. I’m eating it now… Hence me randomly commenting on this site. It’s balongna on steroids. Love it. For sure not the healthiest deli meat… But f*** it. We only live once and could get hit by a bus tomorrow. We love it. Yum!! !